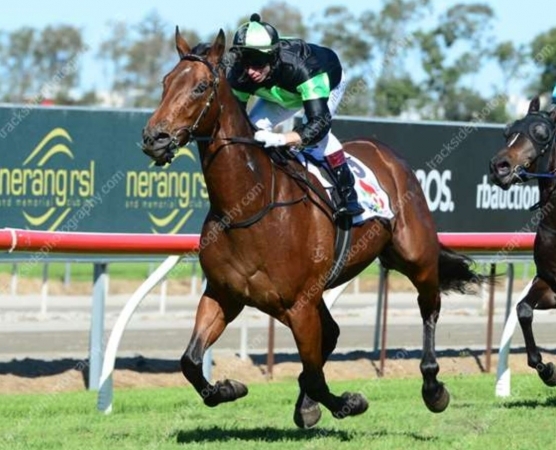 SORNJA is the 5yo Brisbane Metro performer with 2 wins and 13 placings from 27 starts, 5 of those placings at Metro level. 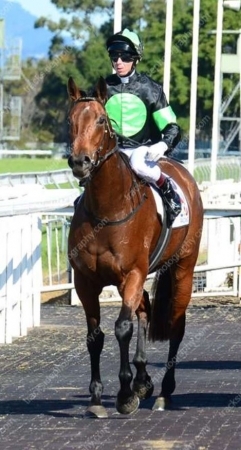 She is a winner over 1200m & 1800m who possesses a big finish with the ability to run quick closing sectionals and it is extremely rare for her to miss a cheque. To date she has earnings of $110,050 with capacity for lots more. Sornja also has residual value as a broodmare after racing being half sister to Listed Winner SILVER CITY. For more information on this quality mare please contact Royal Bloodstock. REAL SAGA (AUS) (2006). 4 wins at 2, STC Todman S., Gr.2. Sire of 357 rnrs, 208 wnrs, inc. SW Candelara (ATC Adrian Knox S., Gr.3), Real Surreal, Sylpheed, Real Good, Sagaronne, Secret Saga, SP Sagatona, Stroak, Epic Saga, Kirabo, Easy Drama, Choose a Saga and of Coastal Prince, Real Princess, Realing, Powerful Saga, Saga Miss, Saga of the Storm, A Day to Remember, No Problem, Outback Saga, Hot Saga, Real Mean, You Did What, Really Swish, etc. SILVER CITY (g. by Nothing to Lose). 3 wins-2 at 2-from 900m to 1600m, WRC Wellesley S., L, 3d ARC OPSM H., Shamrock Recruitment H.
Sornja (f. by Real Saga). 2 wins. See below. Sleep Tight (f. by Real Saga). 2 wins-1 at 2-at 1000m, 1200m, 2d BRC Queensland Breeders TBQA H., Padua College 2YO P., Ipswich TC Jo-Ann Miller MP H., 3d BRC BMAG 2YO H., United Voice Qld H.
In Seattle (g. by Real Saga). Placed in 2018-19 in Aust. Duel Fuel. 4 wins from 1600m to 2200m, QTC Seniors Interest Branch H., BTC Lasseters Hotel & Casino H., QTC Year of Outback H., 3d STC Colgate H.
Tobecanny. 2 wins at 1000m, 1200m, 3d BTC Northlakes Golf Club H. Producer. Pasada. Winner at 1000m in Aust. She's Just Dreamy. Winner. See above. BLUSHING BIJOU (Nassipour). 7 wins. See above. ROMAN LAUREL (Twig Moss). 6 wins-1 at 2-to 1400m, A$87,550, VRC Mollison H., L, VATC Liberal H., 2d VRC Maribyrnong P., Gr.2, VATC Merson Cooper S., Gr.3, Dromana Highweight H., Biscay H., Pelham H., 3d SAJC Tenspot Keno H.
DANCE TO THE STARS (Galileo). 6 wins at 1500m, 1600m, R418,545, Fairview East Cape Paddock S., L, Greyville Bosch Hoek Equine Hospital H., Sasko H., Lions Clubs International H., Scottsville J&B Met P., 2d Clairwood Fourth Dimension Kitchen H., Greyville JVR Steel P., Clairwood Rugby Five Convert It! P., Scottsville Golden Key Society UKZN Chapter H., 3d Greyville Canon Johannesburg H., Union Canvas H., 4th Scottsville Flamboyant S., Gr.3. Producer. St Verdi (Stravinsky). 6 wins at 1200m, NZ$98,700, A$28,800, ARC Singapore Turf Club Trophy, Graeme Thomson Antique Jewellery H., Lindauer Piccolo H., Countdown to Karaka H., QTC Hidden Dragon P., 2d ARC Newmarket H., L, Waikato RC Miss Potential H., 4th ARC Railway H., Gr.1, Hawke's Bay Guineas, Gr.3, WRC Lightning H., L.
WELLS STREET (Magic of Money). 6 wins-1 at 2-from 1400m to 2400m, A$103,500, SAJC Port Adelaide Cup, L, Showies Boutique Regent Arcade H., It's Our Buy in June & July H., Gallipoli Trophy H., 2d SAJC Arab Steed Hotel H., 3d SAJC Cleanevent H.
Whiskey's Gem. 3 wins from 1300m to 1900m, STC Steyne Hotel H., Hoyts Television H., 3d STC Parkroyal St Kilda Road Welter H.
Great Beginnings. Winner at 2, WATC Graduation S.
RECOLLECT (Pretendre). 10 wins-1 at 2-from 1400m to 2600m, SAJC St Leger, Gr.3, TTC Launceston Cup, Gr.3, 2d VRC St Leger, Gr.2, TTC Launceston Cup, Gr.3, 3d WATC Premier's Cup, L, Imperial S., L.
Milluna's Gem (Showdown). 3 wins. See above. DREAM'S DELIGHT (New Regent). Winner at 2, AJC Gimcrack S., Gr.3, 2d AJC TL Baillieu H., L, STC Sweet Embrace S., L, 4th AJC Reginald Allen H., L. Producer. MY WANDERIN' STAR (Western Symphony). 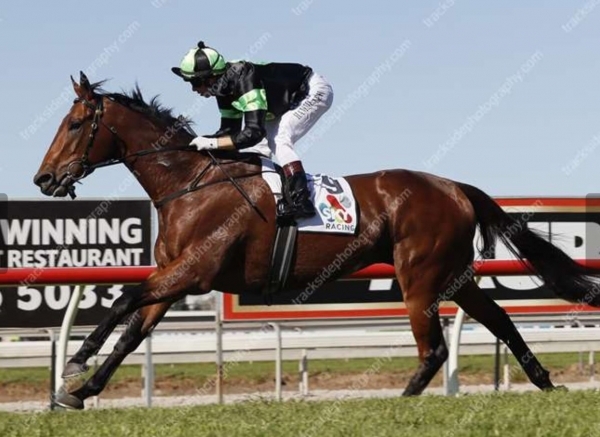 10 wins-4 at 2-from 1000m to 1600m, A$312,750, STC Phar Lap S., Gr.2, AJC Venn Wesche Country Cup, VATC Vain Quality H., 2d STC Tulloch S., Gr.2, VRC Great Western H., Gr.3, Myer Fashion S., L, 3d VRC Maribyrnong Trial S., L, VATC Autumn Sprint H., L.
SUBTLE IRONY (Akhadan). 8 wins from 1200m to 1800m, A$134,325, MRC Heatherlie H., L, VRC David Heuberger H.
BARCELONA (Desert Sun). 4 wins at 1300m, 1400m, NZ$80,512, BOP RC Tauranga Classic, L, 3d Counties RC Auckland Thoroughbred Breeders' S., Gr.2. Producer. ROYAL TREEN (Royal Academy). 4 wins from 1100m to 2200m, A$151,060, M$10,600, QTC Metropolitan H., L, STC General Electric Appliances H.
2 wins at 1200m, 1800m, A$110,050, to 2017-18, GCTC Interrisk P., 2d Qld Tatt's RC Stella Artois H., BRC Memberships H., Spring Carnival H., Channel 7 H., SCTC Pryde's Easifeed H., GCTC Sky Racing H., 3d BRC Global Gallop H.
(5.5) BRC Sky Thoroughbred Central H., A$67,000, 1300m, time 1:19.74. Track soft(7). Carried 54.00kg. Oink was 1st and Billy the Kid 2nd and Lipstick Lover 3rd. Trainer: Steven O'Dea. Owner: Proven Thoroughbreds(Mgr: A J Walter), J J Doyle, K J Schamburg, L J Bryant, S J Roberts, M Newman, Mrs D R Butler, B S Russell, Mrs D P Russell, J H Russell, Mrs J E Russell, P M . Jockey: M Hellyer. (12.6) GCTC McCain Foods Cup H., A$70,000, 2200m, time 2:16.22. Track soft(5). Carried 54.00kg. Exoteric was 1st and Xebec 2nd and Irish Optimism 3rd. Trainer: Steven O'Dea. Owner: Proven Thoroughbreds(Mgr: A J Walter), J J Doyle, K J Schamburg, L J Bryant, S J Roberts, M Newman, Mrs D R Butler, B S Russell, Mrs D P Russell, J H Russell, Mrs J E Russell, P M . Jockey: P Hammersley. 26/Jun/2018 3rd of 5 --trial--BRC Barrier Trial, 840m. Jaydee Indy was 1st and Francisca 2nd. (3.3) BRC BERT & CIP H., A$25,000, 1350m, time 1:19.57. Track good(3). Carried 58.50kg. Lulu Express was 1st and Ponytales 2nd and Nashville Skyline 3rd. Trainer: Steven O'Dea. Owner: Proven Thoroughbreds(Mgr: A J Walter), J J Doyle, K J Schamburg, L J Bryant, S J Roberts, M Newman, Mrs D R Butler, B S Russell, Mrs D P Russell, J H Russell, Mrs J E Russell, P M . Jockey: M R Du Plessis. 03/Jan/2019 2nd of 8 --trial--BRC Barrier Trial, 1000m. Prince of Tie was 1st and Meikas 3rd. (15.4) GCTC TAB Hollindale S., A$45,000, 1800m, time 1:54.23. Track heavy(9). Carried 55.50kg. See the Master was 1st and Pickelhaube 2nd and Own Sweet Way 3rd. Trainer: Steven O'Dea. Owner: Proven Thoroughbreds(Mgr: A J Walter), J J Doyle, K J Schamburg, L J B Bryant, S J Roberts, M Newman, Mrs D R Butler, B S Russell, Mrs D P Russell, J H Russell, Mrs J E Russell, D . Jockey: Boris Thornton.